This safari package includes a variety of safari activities, both on Balule Nature Reserve inside the greater Kruger National Park and a full-day safari in the Kruger National Park itself. You will enjoy a unique African safari experience, go on guided open vehicle safari, listen to the sounds of the African bush while dining under the stars around the fire, or simply relax and let the animals come to you. Throughout the two nights, you will be accommodated at Baluleni Safari Lodge, which occupies its own property on the banks of the Olifants River. This will be a great opportunity for you to enjoy the beauty of South Africa! Vaccines needed: the area is known as a low-risk malaria area; please consult with your doctor or chemist in this regard. The tranquil and peaceful, owner-managed, and full-catering Baluleni Safari Lodge is situated on the banks of the Olifants River, in the 50,000-hectare Balule Nature Reserve inside the Greater Kruger National Park, and offers the splendor of the natural African bush with breathtaking sunsets, wildlife which includes the Big Five, bird watching, safaris and bush walks, and boma dinners under the stars. Baluleni Safari Lodge is often referred to by guests as a "paradise" or "heaven on earth". The lodge is a completely unfenced camp with frequent visitors such as elephants, lions, leopards, hippos, giraffes, and a variety of antelope species such as bushbuck, impala, duiker, kudu, and waterbuck that move in and out of camp. You can enjoy sitting on your veranda or at the pool spotting animals strolling through camp. Managing Directors, Evert and Elke van Eeden, have been crucial to the success of Baluleni Safari lodge. They started the lodge in 2010, as a dream to be part of the successful movement in eco-tourism industry, bridging the gap to create economic growth for the conservation and preservation of flora and fauna along the Olifants River and Balule Nature Reserve. The aim is to give visitors a truly unforgettable safari experience by creating a home away from home atmosphere, in a small tucked away bush retreat. They created an authentic bush experience where people and animals live as one. Baluleni Safari Lodge has two luxury safari tents and each consists of two three-quarter beds with en-suite bathroom, shower, washbasin, and toilet. They are equipped with wardrobe, fan, fridge, tea and coffee making facilities, dressing table with mirror and hairdryer, bathroom amenities, and private patio where guests can enjoy nature, birds, and animals or relax in tranquility. No party, music, or noise is allowed. Baluleni Safari Lodge has five secluded thatched chalets (including a honeymoon chalet) and each chalet consists of a two-meter queen size bed with en-suite shower, washbasin, and toilet. The chalets also have a lounge area with a comfortable sleeper coach (except honeymoon chalet) and a private patio with view to the Olifants River where guests can enjoy nature, birds, and animals or relax in tranquility. They are equipped with built-in wardrobe, air-conditioning, fan, mosquito nets, fridge, tea and coffee making facilities, dressing table with mirror and hairdryer, and bathroom amenities. No party, music, or noise is allowed. Arrive for lunch at 13:00 in the restaurant. Relax at the pool or chalet / safari tent. Enjoy high tea / drinks and see animals in and around the lodge. Depart at 15:30 in an open 10-seater safari vehicle for a safari in the Greater Kruger National Park. Return at 18:30 for drinks and a 3-course dinner around the fire in the boma under the stars. Depart at 05:00 in an open 10-seater safari vehicle for an unforgettable guided full-day journey in the public sector of the Kruger National Park. The packed breakfast and lunch will be served at picnic spots. You will return at 18:30 for drinks and a 3-course dinner around the fire in the boma under the stars. Depart at 06:00 in an open 10-seater safari vehicle for a safari in the Greater Kruger National Park. Return at 09:00 for a full breakfast at the restaurant. Safaris depart from the lodge either in the early morning or late afternoon during the cooler hours of the day. Guests enjoy a three-hour drive in an open safari vehicle with drinks (at extra cost) and snacks for sundowners or an early morning coffee stop with homemade rusks. The Balule Nature Reserve shares unfenced borders with the Kruger National Park, inviting free movement of all wildlife through the reserve. Guests will leave very early in a safari vehicle with a qualified guide on a full-day trip to the Kruger, to reach the gate of the Kruger National Park at opening time. All entrance fees, packed breakfast, packed lunch, tea, coffee, water, and juice are included. Breakfast and lunch will be served at a picnic spot or other rest area in the Kruger. You can enjoy nature, wildlife, and birds in the national park. The guide will return with the guests before the closing of the gates of the Kruger and guests will have time to refresh before joining together in the boma for a three-course dinner around the fire under the stars. Balule Nature Reserve is a protected area in Limpopo Province, South Africa, which forms part of the Greater Kruger National Park as a member of the Associated Private Nature Reserves (APNR). As part of a wildlife conservation initiative, all fences separating APNR reserves - Balule, Timbavati, Klaserie, and Umbabat - and the Kruger National Park have been removed. 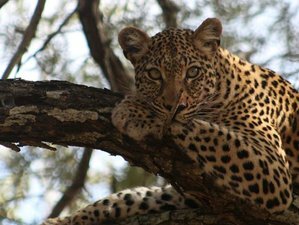 The ecological benefits of this initiative have made the region a popular ecotourism destination, and conservation efforts have ensured that the wildlife population includes all of the Big Five game such as lions, African elephants, African buffaloes, African leopards, and white rhinoceros. During this safari, you will be provided with full board meals, which includes daily early morning snacks, tea / coffee at your accommodation, full cooked English and Continental breakfast with juice, coffee, tea, lunch, high-tea with home-baked cakes served at the restaurant, and three-course dinners (international and African cuisine) under the African stars around the fire at the lodge's traditional Boma. For your full day trip to the public sector of the Kruger National Park, you will be provided with a packed breakfast / lunch at picnic spots. Take the N12 (or N4 from Pretoria) towards Witbank (Emalahleni), Middelburg Plaza. Turn to Belfast, Dullstroom, Lydenburg (Mashishing), Ohrigstad, Abel Erasmus Pass, and J.G.Strijdom Tunnel. 10 kilometers from the tunnel, turn left at fuel service station towards Tzaneen / Phalaborwa. Travel another 10 kilometers to the signboard "Phalaborwa" and turn right towards Phalaborwa. Travel 27 kilometers to T-junction and turn left towards Phalaborwa R40. Pass the Balule, Parsons Gate sign, and continue on R40 (about 20 kilometers) until Grietjie signboard. Turn right into the dirt road. Follow the dirt road for 2.7 kilometers to the gate. After 1.8 kilometers, go straight at the crossing. After 2.8 kilometers, keep left on Y-crossing. After 450 meters, turn left into Baluleni Safari Lodge, Plot 13 Grietjie. After 800 meters, you have reached the lodge. Follow the R40 from Hoedspruit for 51.2 kilometers. At the Grietjie signboard, turn right and follow the dirt road (2.7 kilometers) to Balule Gate. Follow another 1.8 kilometers overcrossing. From Phalaborwa, turn left on the road towards Hoedspruit. After about 20 / 25 kilometers, turn left at the Balule Grietjie signboard. Follow the dirt road to Baluleni Safari Lodge, plot 13. Follow the R71 from Polokwane to Tzaneen through to Gravelotte and continue on straight. Do not turn to Phalaborwa at Gravelotte but continue straight for another 30 kilometers until T-junction. Turn left towards Phalaborwa and continue for about 20 kilometers. Turn right at Grietjie signboard onto the dirt road to Baluleni Safari Lodge, plot 13. Please book your flight to arrive at Hoedspruit Air Force Base Airport (HDS). Transfer from and to this airport is available upon request. The transfer will cost 525 ZAR per bus. Please book your flight to arrive at Hendrik Van Eck Airport (PHW). Transfer from and to this airport is available upon request. The transfer will cost 230 ZAR per bus. There is a transfer service available from Three Bridges to Baluleni at ZAR 280 per bus. Baluleni Safari Lodge offers safari in the splendor of the natural African bush with breathtaking sunsets. They often referred to paradise or heaven on earth. PROMO RATES APPLY BETWEEN 16TH DECEMBER - 31ST JULY !